Trademark SiPami born in 2009, from co-operation between the company P.A.M.I. di Tomaselli S.r.l. and the company Singapore Industrial Product (SIP). Pami Srl is located in Italy, and is concerned with project and production of all products, ensuring the quality and the reliability of Made in Italy, and also the continued innovation testified by several registered patents. Sip is located in Singapore, and takes care of sales and post-sales services for all SiPami products, thanks to an extensive network of contacts with local distributors in order to ensure an immediate reply to the needs of customers all the world. 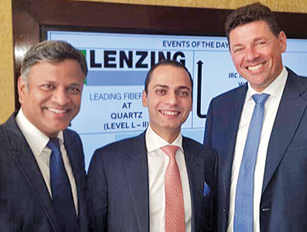 Recently, the company went ahead for a big transformation by changing its name to SIP Italy and became more aggressive to increase its market share in the Indian market. 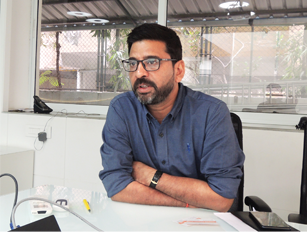 In an interview with Apparel Views Editor Arvind Kumar, Jay Nugessur, MD-SIP Italy shared his views about the recent changes in the company and its plans for the Indian market. Why this change from Si-Pami to SIP Italy in the name? Everybody when they achieve a goal or go little bit higher, their designation changes. Previously, it was one company called Pami, and we were making machines in Pami together with collaboration of SIP Singapore. PAMI & SIP by the trademark SiPami work together to be perfect partner for a garment company looking for long term business relationship, thanks to the experience, know-how, and efforts spent in this field since long time. It is a quarter century brand in terms of denim manufacturing and automation. But now we have added one more manufacturing plant, which is in Verona. We cannot sell in two names so we have combined both. All our machines from this year have started to come with one name i.e. Sip Italy. 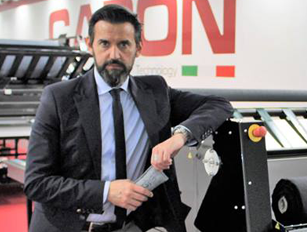 The machines are still made in Bergamo plant and ZS is making in Verona plant. We have done this in order to cope with the market demand. The place in Bergamo is limited with space and most of our people are in Verona. Verona to Bergamo is 250 km so it was very difficult for our people to travel on a daily basis. When did you start your journey in India? In overseas, we started to promote our machines first time in India only. But unfortunately we couldn’t reach all the customers. We have a responsibility of our local agent, I don’t know either it was our fault or their fault. This marketing had not developed and we couldn’t knock the doors of all the customers. That’s why we are late here but in many markets like Bangladesh we are more or less equal to our competitors. In Pakistan and Indonesia we have already taken over, in many markets in South America we became leaders in less than seven years. We started our journey in India by participating in an exhibition in 2006 and sold our machines to leading brands and export houses here. We have a 25 year experience in the field of automation and denim trousers. We have a strong collaboration with Brother Japan Company since five years. Aside from the fact that Brother is our collaborator in terms of the development of our machines and at the same time it provides it’s in the field distribution, marketing of our products in Latin America, the Unites States, Europe Africa and Asia. Since we are having collaboration with Brother, so as a partner we always follow them and respect their rules and regulations. We don’t cross the border so we are only working with Brother Agents in India i.e. in Northern part it is Magnum and in Southern it is Alpine. Same procedure is followed in Bangladesh, Pakistan and our other markets where we only work with Brother Agents. What all range of machines are you offering? We produce best technology for jeans – trouser garment makers together with the best total package service, by production study for efficiency, machinery training, installation and maintenance. We have complete range of machines in production of denim which has maximum 35 operations. What kind of ROI can one expect from your technology solutions? ROI varies from one factory to another/ one country to another/ from one state to another. It depends on how you want to use it and what efficiency you have currently. However, a factory with normal efficiency can get ROI within six months to one year. There are many factories in Sri Lanka and Bnagladesh who have invested in our machines and got ROI in less than six months. In jeans manufacturing where does India stand in comparison with Bangladesh? Earlier automation wise, in denim segment, Bangladesh was behind India but now they are far ahead both in terms of manufacturing and quality. In 2008 when there was financial crisis, Bangladesh was the only country investing in high end technology. India is a big manufacturing hub for denims both in exports and domestic segments. It also has an advantage of having a large cotton base, and biggest share in denim fabric manufacturing. So, it can perform better in denim garments by investing in latest technologies. Moreover, there is a good scope of growth especially in domestic market due to large population of youngsters. Why are you not able to achieve those numbers in India which you are doing in other countries? The marketing people and tools were missing here. We didn’t focus much on sales people and team in India as we were too busy in other countries. As you know, now we are working with India’s leading technology suppliers Magnum and Alpine, so with their support we have started building our sales and service network stronger in India. In fact in last couple of months we have got very encouraging response from the industry. What are your plans for India market? We will be participating in more trade exhibitions this year and spend little bit more in promotion and manpower in India. Indian operators are more Out of these, there are 15-16 operations which could be automised or deskilled completely. Right now if you want to survive you need to go with automatic machines. For me the most difficult thing is to change the mentality of the people here. It is easier to sell the machine than changing the mentality. It will not be of much use if you go for only one or two automated operations and remaining done traditionally. We are not pushing to buy a complete set but a concept to our customers. We are the only company providing sales of machines as well as implementations. We are training not only the operators but middle level management. Training middle management is very important as most of them are coming from one school which is already outdated. expensive than Bangladesh and Pakistan. 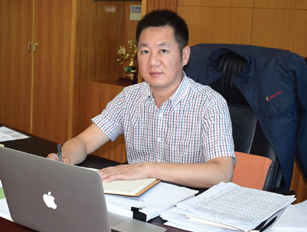 So, that’s why we are here to reduce the manpower involvement in production process with our machines. In each and every industry you always need professionals but there are many segments where it is very difficult to find the people. Like in garment making process people are mostly looking for tailors, so if you are not a tailor you will not get a job in garment factory. We are coming up with technologies to deskill the operators. In India you have large no. of fashion designing schools but not many tailor training institutes. You require minimum of three months training before you work on to train one operation. But with our technologies within five minutes you can do same production like any tailor. Our main machines are for denims but some can be used for non denims also. How do you see 2017 for your company? The future looks very bright here. The govt. has also announced some incentives, I don’t know how it will get realized or materialized but I think they have taken good steps to boost garment industry here. There will be more technological investments but we need to educate people more as no. of people visiting international technology exhibitions from India are very less than other countries. We have to move together with international trends and fashion. We cannot produce a garment in 2017 with a 30-40 year old tradition. Even with our machines, we are following the trends and coming up with what customers want.